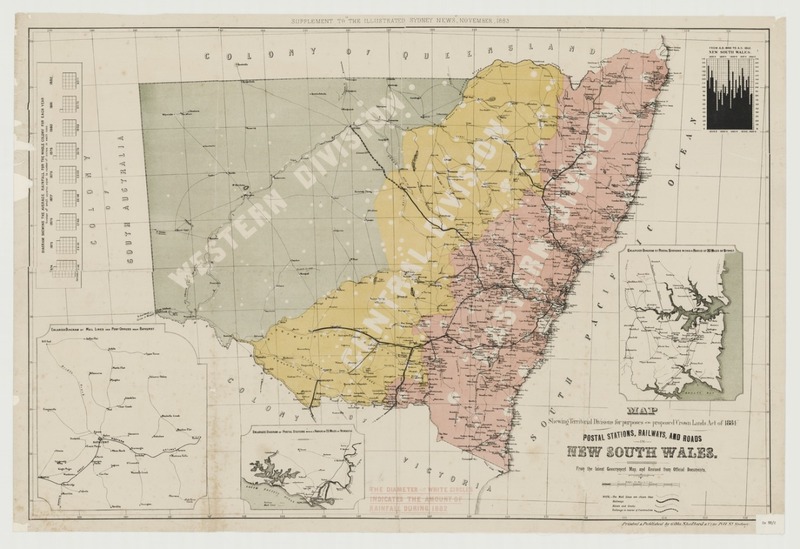 Map shewing territorial divisions for purposes of the proposed “Crown Lands Act of 1884” [cartographic material] : postal stations, railways and roads in New South Wales, from the latest Government map and revised from official documents. Sydney : Printed & published by Gibbs, Shallard & Co, 70 Pitt St., 1883. Scale [1:900 800]. 30 miles to 1 inch. 1 map : col. ; 53.1 x 80 cm. Map showing administrative divisions, towns, railways, roads and rainfall. Relief shown by hachures. Insets: Enlarged diagram of postal stations within a radius of 20 miles of Sydney – Enlarged diagram of postal stations within a radius of 20 miles of Newcastle – Enlarged diagram of mail lines and post offices near Bathurst – Diagram shewing the average rainfall for the whole colony for each year. A zoomable version may be seen here. “Supplement to "The Illustrated Sydney News”, November 1883.